Crazy Ex-Girlfriend’s series finale airs tonight on The CW and I’m in Love is the perfect send off for this wonderful show. Paula is a badass. Her fierce determination and strength is inspiring. Her introduction at the beginning was a little rocky but she swiftly became one of Rebecca’s best friends. They didn’t always see eye-to-eye and had moments when the friendship faltered, but they always found one another again. There’s a moment in this finale when Rebecca thanks those who inspired her, but her own influence on everyone’s lives is just as important. Paula has always been strong, but I wonder if she would have had the courage to speak up in a way that she does in this episode had she not met Rebecca? Valencia will always be a little bit shallow but that’s not necessarily a bad thing. The growth her character has displayed over these four seasons has been beautiful. Breaking up with Josh was one of the best decisions she ever made about her life. And it might not have happened had Rebecca not come to West Covina. The way all of Valencia’s friendships have thrived the past few seasons is because Rebecca helped her view the world a little differently. And Valencia knows what she wants but she has different ways of achieving those goals now. She isn’t perfect and she has moments when her momentum gets a little stuck or sends her character backwards, but so too have many of the characters in this show, and so often do we all have such moments in real life. What’s important is Valencia is happy – and that’s something she never truly was with Josh. So, who does Rebecca choose? Well, you’ll have to watch of course for that answer. With help from Paula, Rebecca makes, in my opinion, the absolute right choice when it comes to which of the three men she will be with and I could not be more proud of her or more pleased with her ending. An ending that is a new beginning. And while we won’t get to see this new phase of her life, she knows who she is, there’s clarity where she didn’t even know it was lacking before, and it’s a bright future full of success and hope and love. She’ll have problems again, of course. That’s just life. But with these four years of work, and of finding answers, behind her she will tackle things differently. We’ve finally truly met Rebecca, and she has met herself, and if this episode doesn’t leave you satisfied, listen again to some of her final thoughts. Thank you, Rebecca Nora Bunch. There were moments in your journey that mirrored our own lives. The audience related to and shared so much with you. You reminded us that mental and sexual health are not the taboo subjects society wants us to think they are, and you taught us how to be honest with ourselves, find our light, and shine. Thank you West Covina and every character we met along the way. 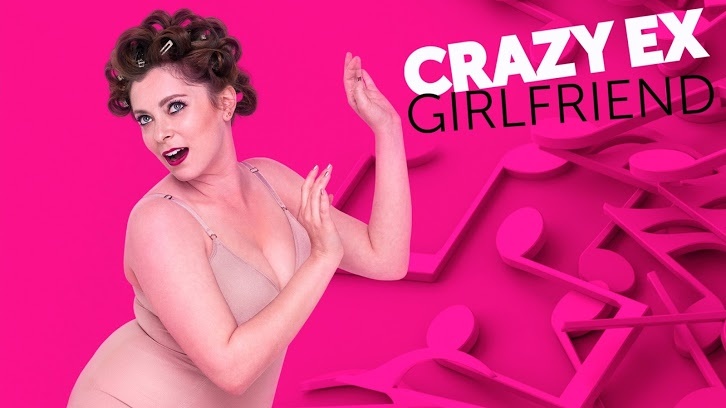 I will always be grateful for Crazy Ex-Girlfriend. We all needed you. We will all miss you.